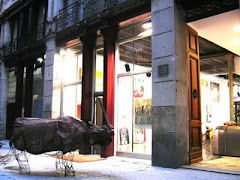 Artevistas Art Gallery Barcelona Blog: New art works by Otero: drawings and watercolor on paper. New art works by Otero: drawings and watercolor on paper. His most common technique is drawing and watercolor on paper, using oil only for conducting large-scale works. All watercolors are born of a quick drawing of sharp and sinuous line, which is always visible under the layers of color. Fascinated by the faces and bodies, he is showing the vulnerability of human beings. In his work, there will be expressions of happiness, but dehumanized characters, lonely and full of tenderness.